Re-printed unedited by exclusive written permission of "Police Review". This article originally appeared in their August 17, 1973 issue. Pursuit or enforcement cars of the two-seater variety are slowly gaining in popularity and probably the majority of cars of this type that are in service with Police Forces are MG "B" GTs. This car combines a businesslike appearance with a reasonable performance, and is capable of carrying a surprising amount of equipment. Now, announced this week, we have a new model, which should make this one of the finest enforcement cars available - the MG "B" GT V-8. External appearance is unchanged except for the cast aluminum wheels and the V-8 motif on the grille and rear panel. Under the bonnet lies the 3.5 litre Rover V-8 engine, basically the version used in the Range Rover and fitted with a low compression head this allowing the use of 3-star fuel. To permit the existing MG bonnet to be used the carburetor layout is altered to place it near the bulkhead, but, in spite of the tight fit, items needing regular attention are reasonable accessible. The performance is exceptionally good, though because of the quietness and smoothness of the unit this is not appreciated. Acceleration is vivid, but there is no "kick-in-the-back" and the power coupled with well-chosen gearing gives first-class top-gear flexibility - the car will accelerate smoothly, and continuously, from 18 m.p.h. in overdrive top. The ratios of the gearbox offer a really worthwhile range of speed in each gear. The gearbox is basically that used in the MG "C" buy Laycock overdrive on top gear is fitted as standard - and is necessary. One problem that exists with this car is that the tachometer must be watch closely when accelerating hard as it's not too difficult to over-rev the engine due to its quietness. I'm glad that British Leyland decided against using the Rover "S" gearbox on this car as it's just not up to the type of work it would get and the "C" gearbox has a nice short "gate" that permits very fast changes if desired. British Leyland have followed through with all the components on this car and have rated the suspension - and brakes - to the performance. The suspension gives a firm but not a harsh ride and is free from pitch and choppiness on practically all surfaces. The standard of ride is very high for the type of car. This suspension, coupled with the rack and pinion steering and the radial tyres, gave the MG "B" GT V-8 exemplary handling and roadholding even on wet roads. The steering is not heavy and offers good feel and precision and is quick to respond to the demands of the driver. Lockheed brakes are used, discs at the front and drums at the rear, and have vacuum servo-assistance. The brakes have a fine positive feel about them that add to confidence and their power certainly matches the performance of the car. They maintained their good standard of efficiency throughout the test and there was no measurable fade after the fade test. Getting in and out of the GT V-8 is no more difficult or easier than the MG "B" GT, or any other car of this type, but a worthwhile improvement in the seating is immediately noticed. The new seats are very comfortable and answer many of the complaints of the past; a good eight-hour stint at the wheel was not particularly tiring. Control layout as far as the gear lever, pedals, and steering wheel were concerned was quite good and the switches for the Police equipment were handy. But the remaining switches for the standard equipment of the car seem to have been scattered around without much thought. The handbrake position close to the driver's seat is not particularly easy to use but this would be cured by the use of a "fly off" type. Some of the important warning lamps are partially obscured from the driver by the lower edge of the instrument panel, while the use of a white warning lamp for the heated rear window is almost dazzling at night. There is no convenient interior light to allow the crew to write in a natural position. The rear tailgate opens upwards, and in so doing, obscures the beacon. The large aperture that is left permits easy access to the rear floor and the equipment. The carpeted rear floor, supplemented by the back of the occasional seat being folded down, provides a surprisingly large area for carrying cones, signs and the like. A further advantage is that equipment stowed at the front end of this floor is also easily reached from the driving compartment. The test car was equipped with a roof sign surmounted by a beacon and the sign was of a triangular shape with the "V" pointing forwards. During the test the opportunity was taken to remove the sign and beacon and go through the entire data procedure again. It was perhaps unfortunate that during the period I had the car there was little or no wind and, certainly, both sets of test data were obtained with other designs - top speed was unchanged and the difference in the acceleration times were so small that it could virtually have been time lost in the gear change so, at least, on this car and under those conditions, the roof sign had no detrimental effect on performance. Comment: This car is very difficult to fault; it goes well, stops well, and handles well in the dry and the wet. It is so perfect for police work it could have been designed specifically for the job. Recommendation: Traffic, with particular emphasis on enforcement. Engine: Eight cylinders in two banks of four, set in 90 degree "V" formation, 3,528cc. Compression ration 8.25:1 delivering 137 b.h.p. (DIN) at 5,000 r.p.m. Twin S.U. HIF6 carburettors, S.U. electric fuel pump. Transmission: Four-speed gearbox with synchromesh on all forward gears and Laycock-type LH overdrive operating on top gear. 9.6 in. diameter single dry plate diaphragm clutch hydraulically operated. Floor-mounted gear lever, direct acting. Three-quarter floating rear axle with hypoid final drive with ratio of 3.070:1. Brakes: Lockheed hydraulic with vacuum servo-assistance. Front, 10.7 in. diameter discs. Rear, 10 in. diameter drums with one leading and one trailing shoe. Handbrake operates rear drums through mechanical linkage. Suspension: Front, independent with coil springs and lower wishbones mounted to a cross-member assembly with lever-type shock absorbers with double levers to carry the top end of the swivel pin. Anti-roll bar. Rear, tube type axle with three-quarter floating drive shafts, rubber mounted semi-elliptic springs. Lever-type shock absorbers. Battery: 2 x 6 volt connected in series, 67 amp/hr. Alternator standard. Measurements: Wheelbase, 7 ft. 6.5 in. Track, front 4 ft. 1in. rear 4 ft. 1.25in. Length 12ft 10.25in. Width with driver's door fully open, 7 ft. 8in. Minimum width required for driver to get out of car, 6 ft. 9in. Turning circle 33ft. 6in. Kerb weight, 2,427 lb. Equipment on test car: Rood sign with beacon on top of it. The sign was triangular with the "V" to the front with "Police" on each side of the "V". The rear part of the sign was divided to show "Police" and "Stop". Signs and cones. First aid box. Police equipment switch panel. Certified speedometer. Heavy duty rear springs. Weather during test period: Both wet and dry with occasional very light breeze. Temperatures, 8-16 deg. C.
Performance tests on dry tarmacadam dual carriageway. Brake tests on dry concrete carriageway. Maximum speed in gears (at 5,200 r.p.m. ): 1st, 40 m.p.h. ; 2nd, 60 m.p.h. ; 3rd, 94 m.p.h. ; top, 120 m.p.h. ; overdrive top, 123 m.p.h. Acceleration through the gears (mean of four runs): 0-30 m.p.h. in 3.2 sec. ; 0-40 m.p.h. in 4.7 sec. ; 0-50 m.p.h. in 6.8 sec. ; 0-60 m.p.h. in 9 sec. ; 0-70 m.p.h. in 11.7 sec. ; 0-80 m.p.h. in 15.1 sec. Overall fuel consumption under simulated operating conditions: Town patrol work, 12.5 m.p.g. Town and rural control work. 17.6 m.p.g. Rural patrol work, 25.4 m.p.g. High speed and motorway, 20.9 m.p.g. Overall fuel consumption for entire test period, 19.9 m.p.g. Instrument correction: Speedometer at 30 m.p.h., accurate. Speedometer at 60 m.p.h. 1 per cent fast. Distance recorder, accurate. Brakes: Footbrake at 30 m.p.h., 88 per cent. Handbrake at 20 m.p.h., 37 per cent. Steering: Turns of steering wheel between locks, 2.25. In the original publication of this article, Police Review included two photographs of their test car. One photograph was a driver's-side three-quarter-view shot that included the police roof sign and beacon. The car's registration plate number was visible: "GOF 88L". A second photograph was taken from behind the car, looking into the cargo area through the lifted tailgate. Various equipment, including traffic cones, were viewable. From this camera angle, the roof beacon was also fully visible through the tailgate glass. Our copy of the article is a faded black-and-white photocopy, and the photos aren't very clear. 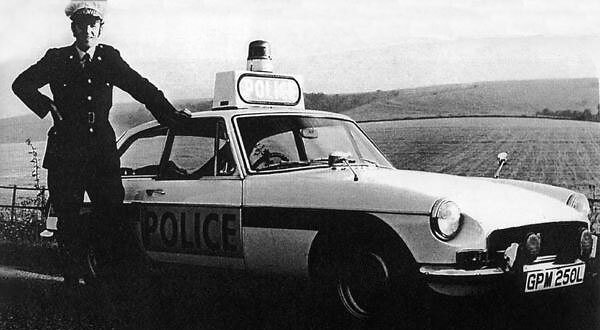 Dear reader, if you have a photo of an MGB GT V8 police car, please share it with us! 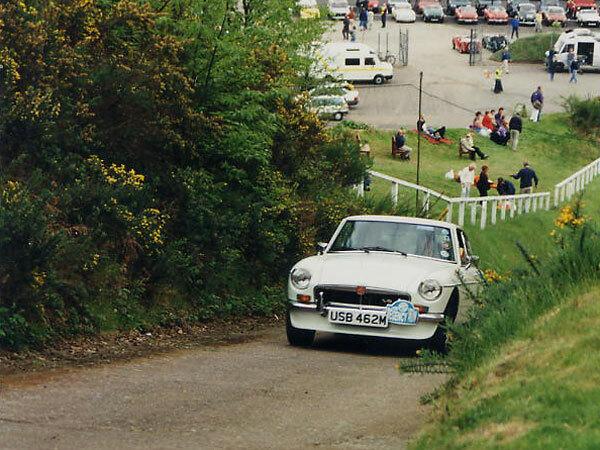 one-lane, concrete strip was used by England's early car builders for testing climbing and braking ability. I still find it hard to believe that the day the MGB GT V8 was announced - 15th. August 1973 - at least one fifth of what would prove to be the total production had been made. My V8's chassis number is 534. I collected my car on 7th. September 1973 and what a wonderful feeling it was driving it home. However I was soon to return to Earth as when running the car in, the internals of the speedo broke up. Worse was to follow, as I was flagged down and told that the brake lights were flashing on and off. Having put these two items to right I was driving in West Sussex - petrol rationing had just come into force - when a white MGB in full Police regalia indicated for me to pull in. Remembering that a 50 m.p.h. speed limit was in force I thought I was going to be booked for speeding. "The speedo must be faulty Officer" seemed like a weak excuse. However, they wanted to look at the car - their first sighting of an MGB GT V8. The police driver said would I mind if some of his colleagues saw it as well. I said no I wouldn't mind and the next thing police cars were arriving from all directions!! In fact a mini concourse with bonnets up. In conclusion the V8 is a great car. This article is part of a set of two! If you enjoyed this article, check out: "Police Report"